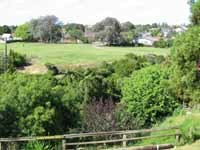 Kodesh is situated on a quiet 3-acre property at the end of a cul-de-sac in a suburb of Auckland, Avondale. Surrounded by trees, bordered by Oakley Creek and overlooking Harbutt Reserve, the peaceful seclusion is an unexpected oasis, only 10 minutes drive from downtown Auckland. Easy access to the motorway and proximity to public service amenities makes it easy to head into the city centre or to venture west to visit the Waitakere Ranges or one of the many rugged and beautiful West Coast beaches. Or, one can simply relax and take advantage of the hospitality and homeliness of Kodesh itself. continue north-bound along SH1. Nearing the city centre, exit at the offramp onto the North-Western Motorway (SH16) - follow the sign towards Helensville and the West. Once on SH16 follow the directions (below) as if coming from the city centre. take Hobson Street onto the North-Western motorway (SH16). Heading west, take the second exit on the left (Great North Road). At the exit, stay left and drive onto and along Great North Road. At the third set of lights, at a Y-junction, head left onto Blockhouse Bay Road. The first road on the left is Cradock Street, and Kodesh Community is located at the end of the cul-de-sac. Follow the signage from there.